Cheap Design: Cheats You & Your Brand! - Go Creative Go! 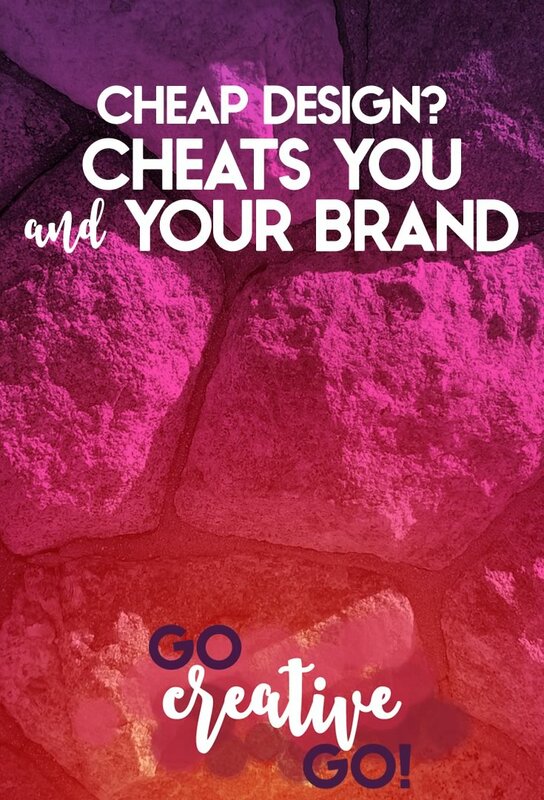 Cheap Design: Cheats You & Your Brand! Cheap design. Easy design. Simple design. Design a website in just a few hours. Design your own logo and launch an immediately impressive brand. Yadda, yadda, yadda, and so on. GACK! Cheap Design Cheats You … And Your Potential Clients! You see them all over the Interwebs. On Twitter, Facebook, Pinterest, etc. What am I talking about? The rash of blog posts and social media ads touting the wonders and benefits of DIY and freebie apps and tools to “design” your brand, your website, and more. This rash leaves me itchy and angry. Not so much in that it demeans what I do at Go Creative Go, but because articles like this, written by people who don’t do as they say while telling you what to do (the most recent was on a site that MOST DECIDEDLY WAS NOT built with a freebie web tool), are a disservice to anyone looking to create a strong and professional brand and presence online. Your brand identity is meant to build trust and showcase your expertise. Your brand is certainly more than your logo, more than your color scheme, more than any single typeface. Thus, I think we can agree that your brand is pretty ding-danged important. Your website is your home, your hub on the web. It is the resting place and repository of your expertise, your experience. But, before anyone dives into your content in order to unearth your gems of wisdom, they’re going to take a look at your home page, or whichever page on which they’ve landed, and they’re going to make a judgment based on their first impression. Cheap Design: What Will It Cost You? You expect someone to pay you, and pay you fairly well, for your product or service, don’t you? It’s the reason you’re running a business, right? You don’t want your target market and audience going out and finding a freebie tool to get by when your product or service can do so much more! Yet, you’re showing that taking the freebie is a smart option with that freebie site design. And possibly losing a sale. It doesn’t take an eye trained in graphic design to suss out a freebie site. No matter how much they tell you they don’t create cookie cutter sites, they – indeed, do. Plus, when you go free, you get freebie company branding as part of “your” design. You get their logo, link and tagline automatically loaded into your footer or sidebar, sometimes right at the top of your header! Yikes. Know what else free fails to deliver? Functionality. Many free web design tools continue to rely on old technologies and development language. Too much outdated scripting language can actually make it difficult, if not downright impossible for search engines to seek out, spider and rank your site. That’s no good! What else? All that outdated and convoluted language can make your site EXTREMELY slow to load. Potentials won’t wait around to see if the good stuff ever shows up. They’ll just move on to the next company that has a site that actually loads and provides them with quality information. Finally, because these are freebie tools, they don’t offer much in the way of truly responsive design, allowing your site to show up in the best possible way via mobile devices. Instead, many freebie tools that offer a mobile option simply create a secondary site for mobile viewing, which means the experience, branding and look might not match up seamlessly with what you’ve created for desktop viewing. Are You Mistaking Cheap For Affordable? When it comes to design, it’s not affordable if it minimizes your chances of making money! Consider that time is money. When free fails you, you’ll have lost plenty of time and effort. Is it worth it? I honestly could go on and on, stretching this article out with a laundry list of laments about freebie tools. But, I won’t – as deep down I’m sure you know that cheap isn’t really the catchy phrase you want tied to your business venture. Put simply, cheap design cheats your expertise and your brand impact. Ready to embrace affordable rather than cheap design? Kind Of A Big Deal? Beware The One-Upper! Dear Community Managers: Please Commune With Us!